Enjoy a modern life at Provident Rays of Dawn! 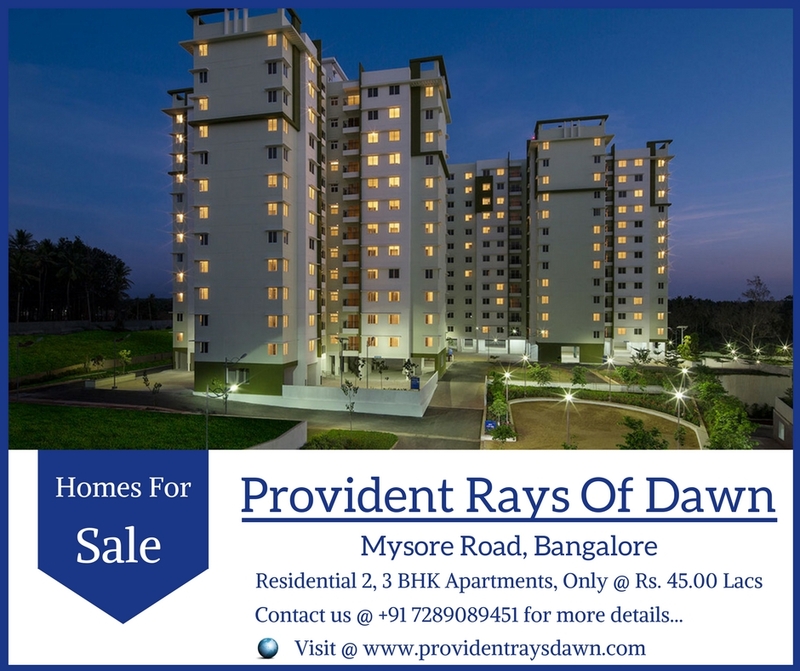 If you are looking for a luxurious apartment on Mysore Road, have a look at Provident Rays of Dawn. The exotic presentation by Provident brings cultured lifestyle with green living infrastructure to the residents. The residential complex has extensive open areas, covering around 80% of its space. You will enjoy the green surroundings, while sitting in the wide balconies and landscaped parks. The interior designing and floor planning in the residential apartment resonates the specimens of master craftsmanship. All the necessary amenities that deliver a cultured living style are present in the residential complex. Investors and homeowners willing to buy an apartment on Mysore Road should buy an apartment in this housing complex now. Buying an apartment on Mysore Road comes with a lot of advantages. Mysore being an important city of India, the roadways and transportation systems has been well developed here. Easy connectivity to all the important areas ensures optimum ease of transportation. Besides, a large number of schools and hospitals have been developed in the area in recent years. Commuters will find it easy to reach their destination. The state and municipal bus services are efficient and provide fast connectivity to the residents. The area has several shopping malls, multiplexes and entertainment zones. You can reach any desired destination in quick-time when you acquire an apartment in Provident Rays of Dawn. The residential complex offers sophisticated 2 and 3 BHK apartments. These have been customised for high-end buyers and middle-income groups. The Provident Rays of Dawn price starts from INR 45 lakhs. However, the price of property on Mysore Road is rapidly rising over the years. You can book an apartment now, as the flats have already been opened up for acquisition. Mysore is an important commercial hub of the country, and still growing, with new investments from blue-chip companies for business. Employment potentials are tremendous in Mysore. Besides, it has a number of places of interest around. The residential complex remains under video security all the time, besides having a reliable security system. The interiors of the apartments are elegant, with wide balconies and polished floors. They come with every amenity you would expect to make your life comfortable. The residents in the estate enjoy 24 hours of uninterrupted power and water supply. Apart from this, other important amenities include lots of sports and healthcare facilities. Health-enthusiasts will enjoy a good time in the area, either in the swimming pool, or gym. Besides, homeowners will have car-parking facility and rain-water harvesting systems here. If you have a fascination for green living, this is the ideal opportunity to materialize your dreams. The residential complex comes with a dedicated play area for kids and various sports facilities. You can enjoy the indoor and outdoor games here, or spend your time socializing with others in the clubhouse. 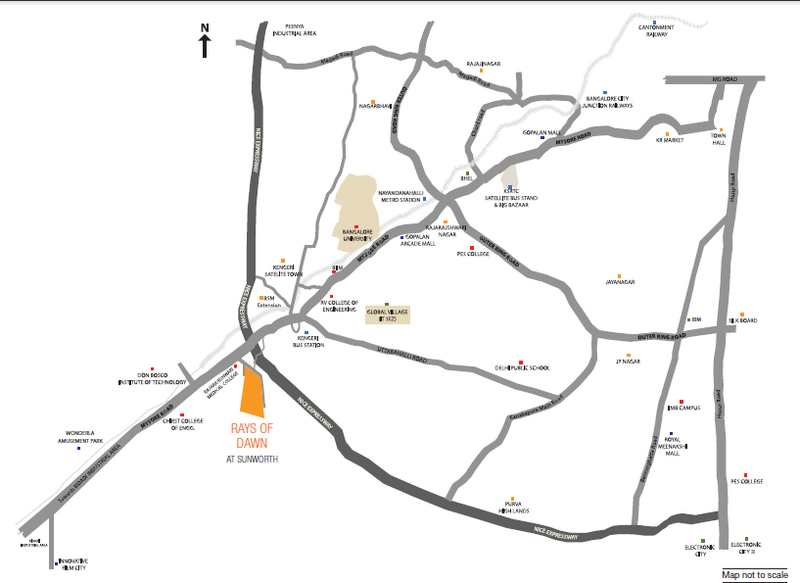 If you are willing to invest in property in Mysore road, buy an apartment in Provident Rays of Dawn. The residential estate offers all the facilities that can breathe luxury and comfort into your life. Get a taste of sophistication and green living, while you enjoy the social infrastructure around Mysore Road. Stilt +12 storied High rise apartments.